This article describes an embodied way of making sense through making with the hands. We examine the potential o ftactile experience in the making process and analyse what tactile experiences mean. 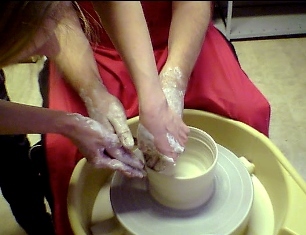 The study takes place in the context of an era marked by audio-visual dominance.The article presents a case study that observed and interviewed deafblind makers while they worked with clay. The findings reveal that modelling in clay resembles the visualisation process of sketching. As such, it may contribute to thinking through the hands. Language is not a self-evident communication tool for transferring tactile skills. Based on our case study, we propose the use of tactile communication in the process of transferring tactile knowledge through making with another person’s hands.